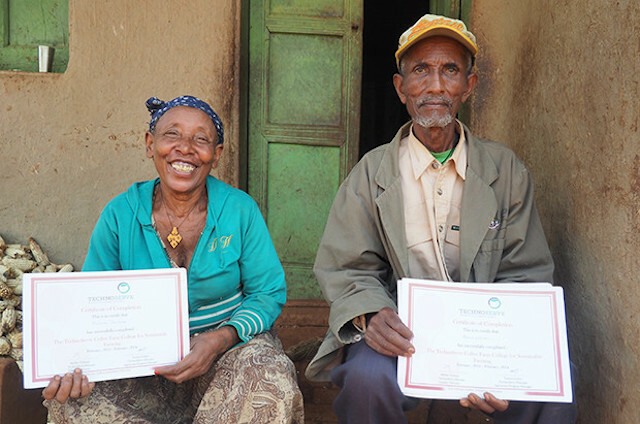 When husbands and wives participate in farmer training programs together, the whole household benefits. This is the sixth post in our month-long #SheFightsPoverty blog series in honor of International Women's Day 2016. Alemu and Almaz Djembe share farming and decision making responsibilities on their Ethiopian coffee farm. Women across the world face daunting challenges: lower income and education levels; inferior legal rights; and consuming family responsibilities. Many development efforts over the years have tried to increase women’s empowerment, with varying degrees of success. And while the problem does require a multifaceted approach, we found that one relatively simple intervention increases women’s participation in household decisions, reduces conflict, and promotes greater cooperation and trust in the household. 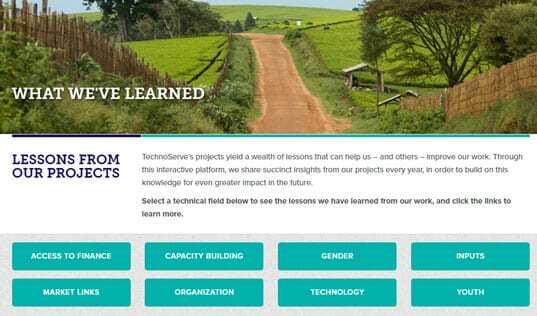 For years at TechnoServe, we have encouraged farmers to join farmer organizations and trained farmers on improved agronomic practices and financial literacy. But we soon noticed that whenever we invited “farmers” to trainings or to become members of farmer organizations, typically mainly male household heads participated. As our field-based studies show, the information gained through trainings or group membership does not generally “trickle across” – that is, husbands are very poor at sharing information with their wives. As a result, the competency gap grows between husband and wife, making it harder for the couple to make joint decisions, as they have increasingly different information, capacities and experiences. The rift that develops creates mistrust, often leading to conflict. The reverse is also true. 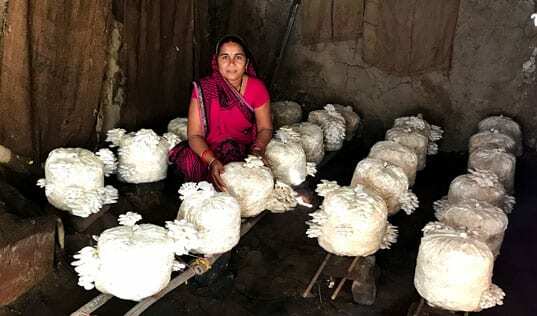 Often, well-intentioned “women’s empowerment” projects focus on building the capacities of women, while neglecting their husbands, with similar negative household impacts, particularly if the activity of focus is a family enterprise, such as farming. A few years ago, TechnoServe started to encourage husbands to bring their wives with them to trainings, and encouraged the wives to join their husbands as members of farmer organizations. Both men and women then received capacity building on topics such as financial literacy and agronomy. The training on agronomy best practices enabled discussion and joint decision-making regarding agricultural production, while the financial literacy training taught couples how to record the revenue and expenses of their farming enterprises, which greatly increased financial transparency in the household. The positive impact of this simple intervention on gender relations was clear. In our Coffee Initiative – a project in partnership with the Bill & Melinda Gates Foundation to improve the livelihoods of smallholder coffee farmers in East Africa – nearly 90 percent of husbands and wives reported that discussion around coffee farming had increased by attending TechnoServe’s training together. More importantly, discussion around coffee income use had also increased. 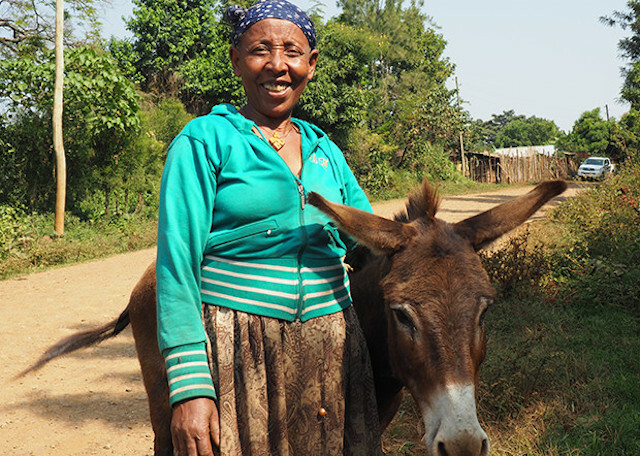 For instance, Almaz Djeme – a 52-year-old coffee farmer in the Jimma region of Ethiopia – first learned about TechnoServe’s training at a Coffee Initiative mobilization event in her village. 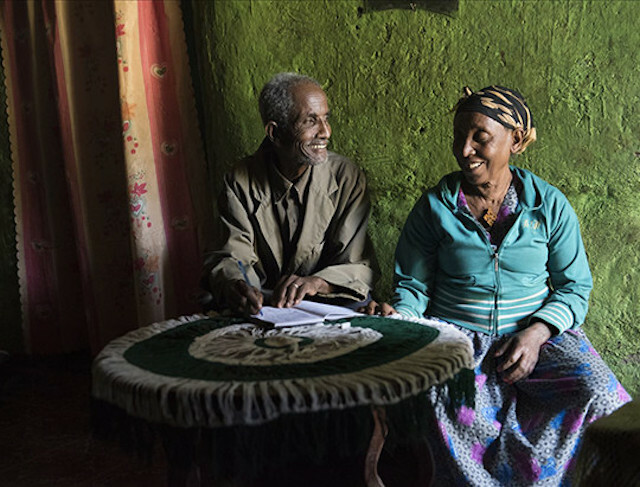 She discussed the opportunity with her husband, Alemu, and they decided to register together. The couple participated in trainings on agronomy and financial management starting in 2012, and volunteered their land for the training group’s demonstration plot. Applying the lessons they learned in the project’s Farmer College, the couple increased their yields by 140 percent. The higher yields meant higher incomes for Almaz and Alemu. With both husband and wife attending trainings and sharing coffee production responsibilities, their level of joint decision-making increased – not only about coffee farming but also about use of the household’s coffee income. Almaz bought a donkey, and Alemu bought a cow. The couple chose to provide more nutritious food to their extended family and to pay for their daughter to earn a diploma in animal science. These effects have been evident across sectors and countries, from cocoa in Tanzania to cotton in Uganda. Field studies consistently revealed that joint husband-wife participation increased transparency, engendered greater trust and mutual respect, increased joint decision-making and reduced conflict and domestic violence. Trainings and farmer organization membership are key components of countless programs in developing countries. But with this relatively simple twist, they could deliver vastly more impact and value-for-money. With greater adoption across development initiatives, this approach can encourage greater adoption and, ultimately, greater empowerment and well-being for women across the developing world.